Adapter Plate Kit - 1989-2002 Cummins to 2003-2010 6.0L/6.4L diesel 5R110, or 1999-2004 5.4 or 6.8L gas 4R100 automatic transmission - Includes a custom, SFI certified, flex plate. The kit includes instructions for the adapter kit only, the engine to transmission adapter, the required custom flexplate, and bolts. - See the Overview for your truck for other important parts that may apply! - No grinding of the transmission is needed! 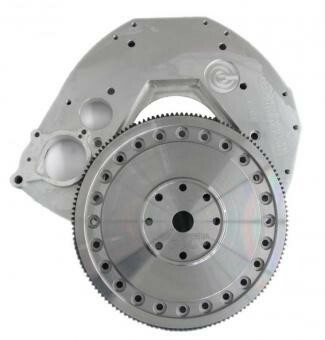 - A custom built torque converter is NOT required. - Minimal and insignificant grinding of the Cummins block is required, but this does not ruin the Cummins engine block core value. - This adapter plate is designed for the 5R110 transmission used behind the 6.0L diesels, but also works with the 4R100 transmissions. - Customers using 5.4L or 6.8L 4R100 transmissions must drill the threads out of the bottom two holes in the transmission bell housing or leave the bolts out. Two holes on the top of the adapter plate are not used with the 4R100. We sell this adapter plate to 4R100 customers so they can switch to a 5R110 later if they wish and not have to buy another adapter plate.